I don’t know about you, but I love movies that are well produced. There’s something really amazing about our ability to be fully engaged in a film and suspend reality when there are no distractions by poor decisions or poor execution in a movie. One of the techniques to really help set the scene and establish location and context is to use wide overhead images, and aerials are one of my favorite vantage points in film. Until the last few years, cinematic aerial shots that we saw on the big screen were limited to those studios with really big budgets. It required the filmmakers to rent specially-equipped helicopters, loaded with high-end stabilizers and cameras, and the crew that could operate them along with it. The cost for shooting just a couple of scenes was budget-breaking for anyone but the major movie studios, and high-end corporate filmmakers with huge budgets. That monopoly on aerial video footage is all changing now due to the breakthroughs in drone technology. 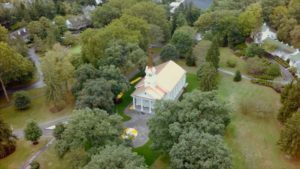 Drones, or as they’re more technically known, UAVs, have brought the dream of shooting cinematic aerials to life for filmmakers large and small. For a fraction of the price of a day-rate for renting a full-scale helicopter, a small studio can purchase a drone of their own, capable of capturing stunning 4K stabilized video. But, should they? While I love the look of aerial video, I equally dislike gimmicks. And the line between using an aerial shot intentionally to further a story, and using it as a gimmick because that’s trendy, is thin and blurry. With the ease and affordability of the tools to create beautiful footage comes the temptation to overuse a drone. We believe that the best uses come in small doses – mainly used as a tool to set the scene by establishing the location, feeling and appropriate tone of the physical space where our film is taking place. Just like any with any other camera or technique, there’s also an art to capturing beautiful aerial video. The scenery could be breathtaking, but if the video looks shaky, wobbly, consists of the camera hunting around for the best shot or angle, the footage will ruin the feel of the film. Most often when we’re filming aerial video, you’ll see us act as a team; working together to manage both the technical aspects of flying a drone along with the artistic details of filming. For wedding films in particular, especially ones at unique outdoor spaces or resorts, an overhead view can really showcase the beauty of the venue. And fall weddings in West Virginia are just begging for some colorful scenics. As with any new technology, there are folks using their drones irresponsibly. You’ve seen the news headlines I’m sure. 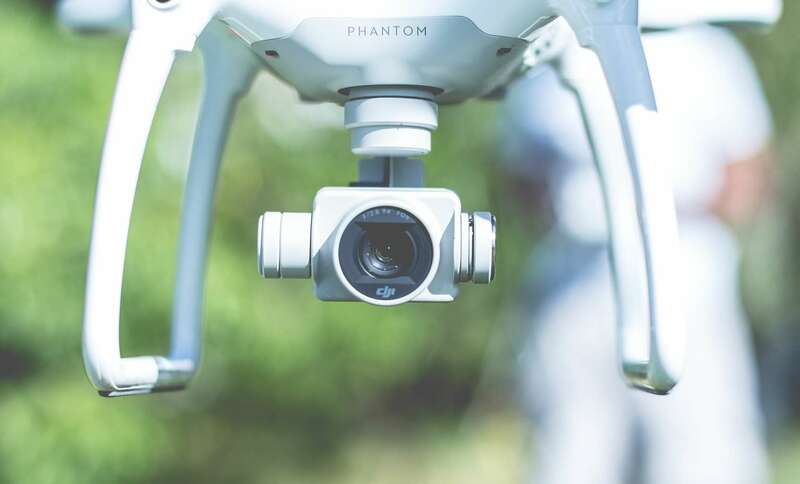 For a filmmaker to use a drone in work they are being paid to create, the FAA (Federal Aviation Administration) requires the individual to take a knowledge test to be licensed. Until recently, it was extremely difficult to legally operate a drone for commercial use. At MotionWorks, we believe in doing things the right way. That’s why we took the time and expense to complete a training program and to be tested and certified by the FAA. This means that we’re able to safely and legally capture drone footage on your project. We think it’s important to be licensed, and you should always ask the studios you may be considering for your project to provide their FAA Part 107 license before allowing them to fly, for everyone’s safety. Safety isn’t the only concern; property owners and venues want no part of the liability that comes along with having an unlicensed pilot operate a drone; your property or event insurance would likely not cover unlicensed usage, and both studios and their clients could be held financially responsible for damages. For us, aerial video is pretty basic: it has to serve a purpose for the film, it has to look good, and it has to be safe and legal. We love the polished look that a well-placed and intentional aerial shot can bring to a film. Let’s talk about how we can create one for you! My boyfriend just for the Phantom 4 so I can’t wait to share this article with him! We are just starting to get into the city shots and making videos. Thank you! !